Written by Gabby, his partner, as of 1 May, 2010. Yes, Tristan started talking in early December (shortly after he ripped out his tracheotomy tube). What does he say? Does he know who he is? Tristan knows who he is and he remembers his pre-injury life. He’s maintained a lot of specialized knowledge, he tells stories, he recognizes people in pictures, he sings his favorite songs, etc. His long term memory for life before the injury is generally excellent. What does his voice sound like? Is there heavy slurring? Does he have trouble formulating language? Tristan speaks clearly but softly. We have very good communication from him, but it can be difficult to hear what he’s saying if there’s competing noise. While other cognitive functions have been impacted, Tristan’s language abilities are more or less intact. He’s maintained adult grammar and vocabulary and has not needed therapy to re-learn language. How did Tristan communicate during the months before he was talking? Before he was talking, Tristan communicated primarily with gestures and pantomime, and also by writing and spelling words out on a communication board. (Although it’s very difficult to read his handwriting, and it used to be much worse. )In earlier days (and for a long time) Tristan had very limited and sometimes inconsistent communication, primarily with yes/no hand signals. Besides hand signals, communication was also achieved by presenting objects or writing choices on a board and asking Tristan to point to the correct or desired one. In the bad old days, Tristan could really only handle two options at a time. I hear he was in a coma. Tristan was never in a coma, but he lingered in a “minimally responsive” state for his first six to seven months post-injury. During this time, life was almost completely dominated by medical complications and Tristan could only maintain wakefulness for a few minutes at a time. It was a horrible period with a lot of uncertainty about whether or not life would ever get better, but he pulled through it and it has. In August Tristan had two surgeries, a Cranioplasty (a reconstructive surgery on his skull) followed by a VP Shunt (to regulate the flow of Cerebrospinal Fluid in his body). Tristan started noticeably “waking up” more following the shunt surgery, then experienced a very serious infection and went septic. He was put on high doses of intravenous anti-biotics for an extremely long time. Weeks later he emerged from the fevers and started making the slow climb out of the abyss. Has his personality changed? How has Tristan been most affected cognitively by the injury? Tristan has maintained a lot of his values and knowledge base as an activist and as the person we knew, but he has been profoundly affected by the injury to his brain. Among other things, he suffers from difficulties with impulse control and short term memory retrieval that impacts everything he does all the time.I’m afraid in answering this question that I’ll give an overly optimistic or an overly pessimistic view to the people who are reading it. At various times talking to friends, I feel that I have done both. The fact is, it’s complicated. Brain injury can make a person a bit of an enigma. For instance, Tristan can legitimately play adult trivia games at a higher level than I can, but he can’t play Connect Four or other simple children’s board games because he gets too caught up in putting all the pieces in and he can’t wait his turn. Tristan oscillates constantly between being knowledgeable and insightful to being unreasonable and child-like. There is never a time that I am unaware of his injury. What parts of his body and brain were injured on March 13, 2009? Tristan was shot in the forehead above his right eye and was primarily injured in the right frontal lobe of his brain. He also suffered injury due to hemorrhaging and swelling during his first week in the ICU which very nearly took his life and did more damage. These secondary injuries caused significant harm to the right temporal lobe and to other areas of his brain.Tristan was also blinded in the right eye and the orbit (the bone surrounding this eye) was smashed to pieces. He is classified as having had a “severe” traumatic brain injury. How has he been affected physically? Tristan is hemiplegic. He is not completely paralyzed but has almost no movement at all in his left arm and left leg. This is particularly difficult for him because he was left handed.Tristan is also still recovering from the extensive damage done to his body by the months of being mostly bed-ridden and immobilized. Tristan is in a wheelchair. Recently we’ve been seeing some movement come back in his left hip, and his physical therapist feels optimistic that given proper therapy, he will be able to regain some ability to walk. However, she has warned that this may take years of work. What is daily life like for you guys at the Rehabilitation Center? On a good busy day, the mornings are a flurry of activity as Tristan moves between physical, speech and occupational therapy appointments. We squeeze in two meals and hopefully have time leftover for exercises and practice on a Standing Frame (a supported structure in the physical therapy room that lets Tristan’s body get used to standing again.) Sometimes we also use a recumbent style stationary exercise bike that Tristan can peddle actively using his right leg and passively with his left.In the early afternoon Tristan goes back to bed and rests for about two hours. He typically gets up about 4:00 or 4:30 and goes on a long walk with his father, then comes back and eats dinner. He eats a lot of variations on rice and beans and vegetables and a lot of different kinds of soups. After dinner we figure out what to do with the rest of the evening. Sometimes Tristan works with a computer. Other times we play card games, board games, stuff like that. We try to get him used to operating his wheel chair for himself. Sometimes we work him pretty hard, other times we just hang out. We read to each other a lot, including some of Tristan’s old writings. We try to keep him company here and do something in between “work” and “play” in the free time we have. Mike, Nancy, and I have no lives at all. We’re here at the hospital pretty much all the time. Does he ever get out of the hospital? Not very often, but sometimes. We try to get out on the weekends. How is he handling this emotionally? For better or worse, Tristan has never heavily grieved over his injury. He is very aware of ways that the injury has affected him physically, but less aware or accepting of the cognitive repercussions.In the last several months we’ve seen him slowly start to get more in touch with his feelings, and I believe this will continue to develop with time. Are you still seeing improvement in his abilities? Is he still in critical condition? No, at this point, Tristan is in the post-acute stage of his injury. He’s living in a hospital because he gets rehabilitation there. Is he pretty much independent now or does he need a lot of help? He needs a lot of help. What’s happening with the court cases? There are two court cases, a criminal case and a civil case.As of now, the Israeli Police who investigated Tristan’s shooting have closed the case without bringing criminal charges against anyone involved. The investigation has been widely criticized as a sham, and we are appealing this decision. What is the basis of your appeal to re-open the criminal case? The investigation into Tristan’s shooting is a perfect illustration of why the police and the army can not be trusted to investigate themselves.The investigators, for instance, never even bothered to go to the scene where the shooting took place. No physical evidence was ever collected. Additionally, eye witnesses uniformly testified that the shots were fired from a nearby hill. 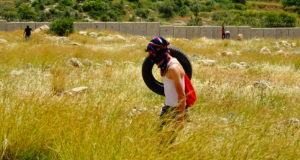 Even though the military has confirmed that indeed there were Border Police armed with high velocity tear gas positioned on that hill, the entire investigation into Tristan’s shooting relates instead to the irrelevant conduct of an irrelevant squad of Border Police positioned on the other side of town. To date, the Border Police on the hill where the shots were fired have never been questioned. Is there anything we can do to help demand justice for Tristan? We are demanding that the criminal case against the Border Police involved in Tristan’s shooting be re-opened immediately and a meaningful investigation begun.Friends are urged to contact Barbara Lee, Tristan’s representative in Congress (202-225-2661) or to picket their local Israeli Consulate, demanding that Israel take full responsibility for Tristan’s shooting. We also recognize that during the time that we’ve been here in the hospital with Tristan, two other activists have died at demonstrations against the Wall. Their names were Basem Abu Rahme and Yousef ‘Akil’ Tsadik Srour. 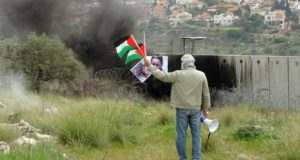 Basem was killed while screaming to soldiers that this was a non-violent demonstration and telling them to stop shooting at a woman protester who’d been injured. Akil died coming to the aid of a sixteen year old boy who’d been shot in the spine. 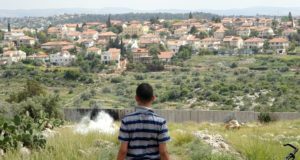 To date, Israel has killed 23 people to build their Wall, and seriously wounded many more, including Ehab Fadel Barghouthi (age 14), shot in the head at a demonstration several weeks ago. Putting finishing touches on this document, I learn that Ahmad Sliman Salem Dib, age 19, was shot to death just days ago on the 28th of April, at a demonstration against land seizure in Gaza. Demanding Justice for Tristan is also demanding justice for them, and recognizing the role of the United States government in war and occupation around the world. Will Tristan make a full recovery? Do the doctors have any kind of long term projection? There is no long term projection. As long as he’s still doing better, no one can tell how far he’ll go. But the fact is, you can’t just shoot somebody in the head and then take it back. Dead brain tissue stays dead, but the human mind can learn to compensate.The most common metaphor I’ve heard to describe brain injury rehabilitation is this: You’re traveling down the road and the highway is blocked. The question is: can you find a way to get to where you’re going using the back roads? People who are successful at brain injury rehabilitation form new pathways and find them. When do you think he will be ready to come home? This is also the question that Tristan asks all the time. We expect to fly back in to California some time in the summer of 2010.Tristan will move in with his parents and live with them in their small rural town. He will continue his rehabilitation on an out-patient basis from there. We plan to also set up a satellite home for him in the Bay Area and move back and forth. My hope is that friends and family will accept Tristan for his abilities and disabilities, and find ways to welcome him back home. For anyone inspired, there will be a lot of work to do.